The Billionty-Oneth Geek: The Flash, Age of Empires 2... Oh Yeah and Stuff! The Flash, Age of Empires 2... Oh Yeah and Stuff! The Flash is the fastest man alive. He can move at the speed of light; he’s even faster than Superman. He utilizes his accelerated speed in travelling, in missions… to fight crime in general. As I was reading the Blackest Night, I was sort of blown away by the Flash. It was not a new revelation or anything, just more of a realization on my part. The Flash can move at the speed of light, yet he doesn’t always exercise the ability. Why not? If you could move like lighting, why wouldn’t you always stay in that mode? And this is when it hit me in my dream. Although he’s the fastest man alive, he knows at times, it’s necessary to slow down and spend time with those that he cares about; those that run at different speeds. To spend time to grow his community/the Justice League. The day after I had that dream, I started thinking about Age of Empires 2 – a game I played partly during high school, but more relentlessly during the early university days. A common feature to real time strategy games is the ability to group units. It’s a way of managing and commanding your troops more efficiently. Grouping gives you the ability to hit a single key on the keyboard to select a group of units that you formed. It’s quicker than highlighting, selecting and commanding the same units over and over. In AoE2, grouping had a unique (but sometimes frustrating) feature. When you grouped together a fast-moving unit, like the Cavalry, and a slow moving unit, like the Trebuchet, the faster units would always conform to the speed of their slower, but more powerful counterparts. It can be frustrating in the heat of a battle, when you’re trying to get your troops out as quickly as possible to the front lines of battle. And although it was frustrating from our perspective, it was good for them. The fast soldier knew that it was better to slow down, stay as a group and fight together. So how does this relate to life? Well first, I’m not saying that I can run at the speed of light. Secondly, I’m not saying that I can outrun a Cavalry… but I do think I’m trying to say that I can run faster than a Trebuchet. Moreover, I’m trying to say that we all move at different speeds. But really, this has nothing to do with how fast or how slow you run – speed is incidental. It’s more of a reminder to be mindful of all those surrounding you, and if it requires slowing down, then it’s okay to slow down. While always being on the go, it’s easy to lose sight of all the greatness that surrounds you. God blesses us with so much. Don’t get caught up in the doing; get caught up in the being. We need to be there for each other if we are to be a community. I say this with much conviction. For me, the difficult thing is that on most days of the week, I’ll have something planned out and scheduled. I’m sort of boxing in life instead of living organically. And I hate that. I didn’t realize it until yesterday, but even my roommate pointed out, we live in the same house, yet we hardly see each other. So many different things have happened in my life in the past little while, yet those close to me don’t even know. I need to keep up and even gather together other Trebuchets and the Cavalries (I see myself more as a Pike Man). “Now that I’ve changed pace of life a bit, becoming a regular working joe, a bonafide blue collar boy, I’ve been thinking more and more about life, rhythm, time, pace, pattern, equilibrium, sabbath, etc. The change has affected my devotional life, my physical rhythms, my priorities and understanding of how many, if not most, people experience life and the average "work week". It becomes increasingly more difficult, but also more important, to keep connected to God, to find time to do the stuff of life other than work, and to find and maintain equilibrium within." The thing is, the more I think about it, the more apparent it becomes that it’s not a Christian message or idea at all. I mean, although community and fellowship are fundamental aspects of being a Christian, the idea of maintaining and cultivating relationships is not limited by faith boundaries – it’s important for everyone. 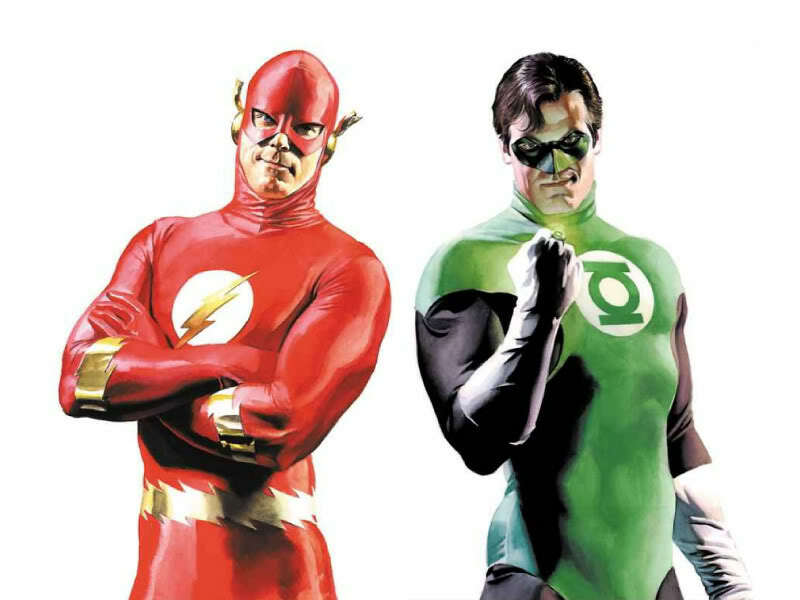 The great thing about the Flash and his friendship with the Green Lantern, and hopefully, between the Cavalry and Trebuchet, is that anytime they need to slow down, it’s not for self-serving purposes. It is to encourage and build each other up. In both cases, they know it’s better to fight together than on their own. “Slowing” down is not about you, but them. We need to find that right balance, of running the distance by yourself, and running alongside others. What Matt alluded to is right. It’s okay to run, but run with rhythm.